Hi, Guys. I'm starting to deliver THE50. During confirming orders, some guys dropped out. So I will give those spots to newcomers. 1. Pls watch the video and the requirement below. 2. Tell me the color and your address, and email adderss. 3. I will send you the pics of THE50 upcase I picked for you, and confirm the shipment fee and paypal fee. 4. If you decide to purchase, I will invoice you. The process may take days, and I'm a little busy these days with my daily job. Forgive me if I can not reply instantly. Sorry, guys. I promised I will make a video this week to show you the final kits. But I've been really busy this week and I will be on a business trip for several days. So forgive me and be patient. After this time, I have a reliable vendor to provide products. The quality of spots will be better. For those who made a reservation, I mentioned in the original notice there will be a requirement to buy THE50. Since the video will be late, I would like to announce it. You have to provide a photo with a keyboard you own which is smaller than 60%(daisy will be the best), and a piece of paper with your ID on it. I checked some guys from Reddit or INS with already posted photo like that, I will not ask again. I will put buyers who are actually using 40% first. This is the first round of THE50 and I hope small keyboard users, especially 40% layout users could help me to improve THE50. And also because the quality is not good this time. So I made this requirement to give more opportunities to 40% layout users. Next round, I will deliver better quality and open to all users. Thanks for understanding. Thank you guys for being interested in THE50. When I first wrote the IC post on GH, there are not many responses. I thought it may not come to reality because the layout is simple and rare, probably no one would like it. And at that time, I still had other designs to complete. But in next several months, I got serious vendor issues, I decided to change the vendors and make this budget THE50 come to reality first. THE50 became my test of vendors. I picked 4 vendors to complete the parts. At that time I was not sure how THE50 is gonna be. That's why THE50 didn't make it to GB. I don't want people receive the kits and get disappointed-"this is not what I expect!" So I decided to make 30 kits in total this round, and sell spots. I will make a video review after all parts are ready, so you can decide you're gonna buy it or not. The final price may be slightly higher than I thought due to the re-doing of some parts, it will be 120USD excluding shipment fee. I will use S.F. Express and the shipment fee sending this kit to USA is about 30USD. The shipment fee will be charged as actual after confirming orders. 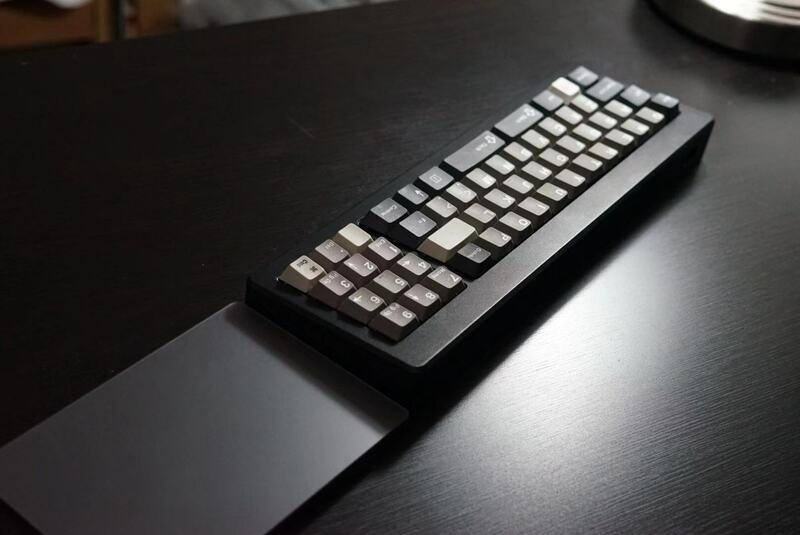 Although I really want to make budget keyboards with good design and good quality, I'm not sure this time I make it right. After all, it will be judged by you after you see the video. Q: Is there any extra PCBs or plates available to buy? A: Sorry, I only made two extra PCBs for customer service use this time. I will not change the mounting structure of plate. If round 2 is opened, I will provide seperating buying choice of PCBs and plates. You can buy extra PCBs and plates then, and I think I will add more layout compatibility that time. Q: What keycaps should I buy to use on THE50? A: In most of the cases, you only need an additional 1.75u on the main area, and 1u zero and 1u enter on the numpad area. Most of GMK base set are fully compatible. If you want an exact set, you may have to look for 40% add-ons. Q: Is THE50 based on QMK? We are working on pushing THE50 to the master. Before that, users can use kbfirmware instead. I'm working on an instruction, but I think most of users are familiar with QMK firmware. Beautiful work! Would love a hot swappable version of the PCB as well! Just bought a Rama Koyu board but would actually prefer this! Bummer you did not get more replies from GeekHack. The site is very difficult to read and navigate easily so I don’t spend as much time there. I think Reddit would be the best place to get word of mouth going for your next round! Thanks! Really appreciate your support! I think I should use Reddit or maybe INS also to update news of my design. your post on reddit showing off THE50 with Pulse SA got way more traction than GH.. honestly didnt even see it on GH. And like Don said it is a poorly designed site, like its stuck in ’95 lol. anyway, I am really upset I missed out on a reservation, I would easily pay double for a chance to have one of these, hot swap or not. It is such an amazing layout, I cant believe no one has ever thought about before. 40% with versatility of fullsize.